Finland is often referred to as a true Winter Wonderland – for a good reason. In Finnish Lapland the winter lasts 7 months on average. For the majority of international travelers, snow itself is an attraction and a reason to travel to Finland. For decades many winter destinations in Finland have lifted the snowy experiences up a notch: Each winter, dozens of unique structures are built out of snow and ice all over the country, from the world’s largest snow castle to wedding chapels, ice restaurants and even saunas. This winter, to celebrate Finland’s 100th birthday, the very first Cave Ice Carving World Championships will be organized in the municipality of Leppävirta in the Finnish lakeland. The contest will bring along even more unique ice sculptures for travelers to admire. Let’s have a closer look at the unique winter destinations in Finland, with the most amazing structures built of snow and ice, shall we! 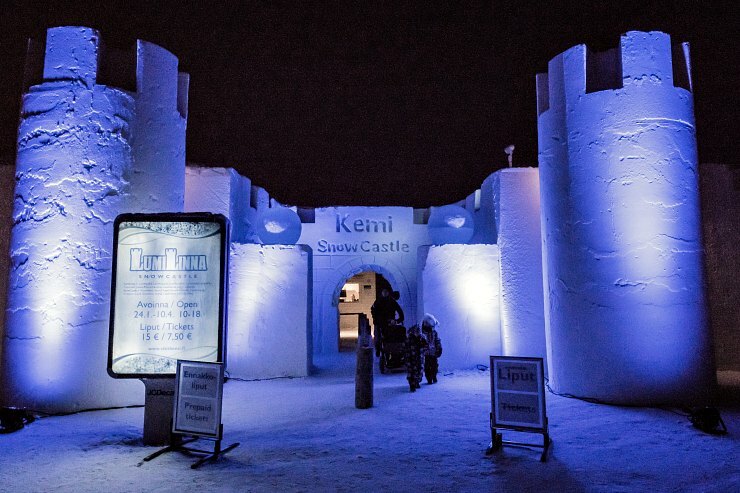 Built first time in 1996, Kemi SnowCastle was the biggest snow castle in the whole world, earning its place in the Guinness Book of World Records with its 1,100 m (3,680 ft) long walls. Already during the first winter, the Kemi SnowCastle was visited by more than 270,000 people from all over the world. Kemi SnowCastle in 2016. Photographer: Timo Laapotti / Kemi Tourism Ltd. The opening ceremony of the 22nd Kemi SnowCastle will take place on the 21st of January 2017. This winter, the SnowCastle will be built in a new location (see the map below). Finland will celebrate 100 years of independence in 2017, and this will also be the theme at the Kemi SnowCastle, inviting tourists to admire probably the most fascinating structure ever built of snow and ice. The SnowCastle area houses the world’s largest SnowRestaurant, the award-winning SnowHotel, a beautiful SnowChapel and magnificent ice sculptures, all completed with atmospheric illumination. Staying in the SnowHotel will be a once in a lifetime experience. Alternatively, you can find yourself a cosy cottage in Kemi area here! Located next to Pallas-Yllästunturi National Park, in the municipality of Muonio, Torassieppi Winter Village offers travelers unforgettable and icy experiences in the heart of Finnish Lapland. How would a cup of hot chocolate taste like in an ice restaurant? 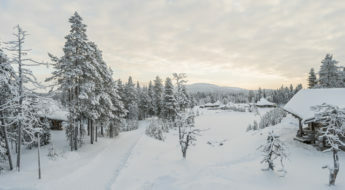 Photo: Harriniva Hotels and Safaris / Torassieppi Winter Village. 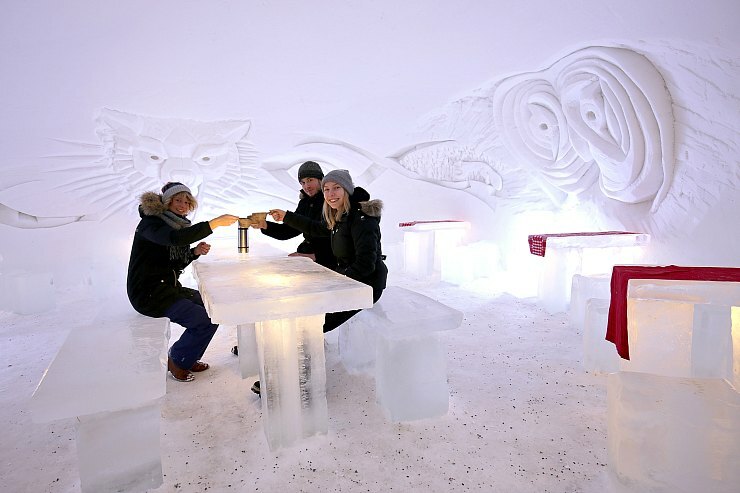 After a day of activities, from husky and reindeer safaris to snowshoeing, imagine yourself dining in the ice restaurant, where all the tables and benches are carved from ice. How wonderful would a cup of steamy hot chocolate—perhaps strengthened with a touch of mint alcohol, as Finns often love to enjoy their hot chocolate—in a bar built of nothing but snow and ice? Also Torassieppi Winter Village offers unique accommodation in real igloos, just like people in Lapland have done for centuries, with warm winter sleeping bags and reindeer hides, of course. Thanks to the thick snow walls, the indoor temperature in the igloos stay in comfortable -5 degrees even if the temperature outside the walls would drop as low as -35. For more traditional accommodation you can also check out the rental cabins available in Muonio area on Gofinland.fi. Are you about to say I do? 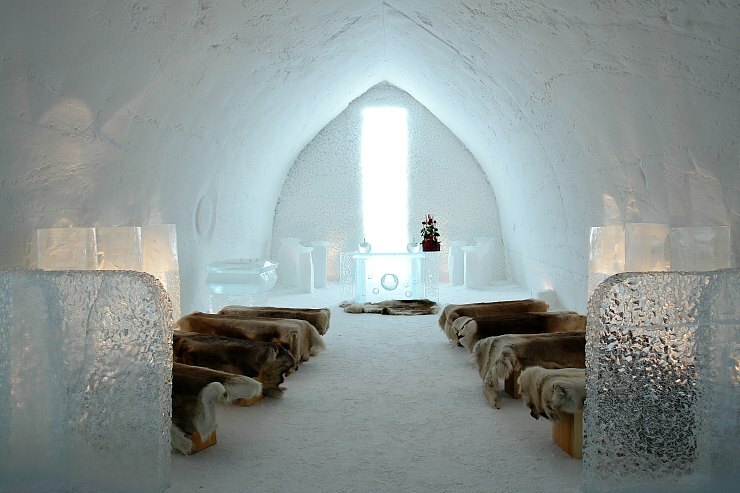 To make your wedding truly unforgettable, you can make your vows in the beautiful Ice Chapel of SnowVillage in Kittilä. Make your big day even more magical by saying I DO in the beautiful Ice Chapel in Lainio SnowVillage. Photo: VisitFinland. The chapel will be decorated according to your wishes, and the full service wedding coordination assures all necessary paperwork and other arrangements will be done for you. All you have left to do is to enjoy the most magical day of your life—with an after party at the igloo disco! Every year approximately 20 million kilos of snow and 350 000 kilos of crystal clear natural ice will be used to build this true winter wonderland in Kittilä. Besides the chapel and the Ice Bar, SnowVillage features Snow Hotel, Ice Restaurant, a slide and an extensive network of corridors full of breathtakingly beautiful art made of snow and ice. After visiting the spectacular SnowVillage, you can spend the rest of your holiday at a private cottage in Kittilä area or in Levi. Sauna Made of Ice? I’m Not Kidding! Oh Finland, the promised land of hot, steaming saunas. Besides regular saunas, in Finland you can experience a traditional smoke sauna, sail on a sauna boat, or you can even find a bus with sauna. But the most unique sauna experience—that is quite an extreme experience even for a Finn—is ice sauna. Nearly every Finn has a sauna in their house, but ice sauna is quite an extreme experience even for locals! Photographer: Harri Tarvainen / VisitFinland. Yes, you read it right. It really is possible to build a sauna out of ice, no matter how surreal it sounds like. In fact, several ice saunas are built all over Finland every winter. Located in Kuusamo, Rukan Salonki builds the coolest sauna in Finland on the ice of Salonkijärvi Lake. This ice sauna fits as many as 10 people at a time. To complete your extreme sauna experience, you can dip yourself in an icy lake between throwing water on hot stones. Book a full sauna tour and find a cottage in Ruka on Gofinland. Located in Rovaniemi, SantaPark theme village houses an ice gallery that is open for visitors all year round. The stunning ice sculptures showcase the true Lappish culture; its’ nature and wildlife, people and life in Lapland. You don’t have to travel all the way to Lapland to experience Lapland! Winter World Helsinki is built inside Kivikko Ski Hall, just a 15-minute drive from the city centre. Igloos, ice sculptures, sliding hill, kick-sledging and other fun winter activities have been made possible even if there was no snow outdoors. To celebrate Finland’s 100 years of independence, the first ever Cave Ice Carving World Championships will be organized in the municipality of Leppävirta between the 13th and the 18th of February 2017. Also an ice castle with walls, towers and slides will be carved in the competition area. Once the contest is over and all the sculptures are ready, the new world of ice with all the sculptures will be open for visitors until the 14th of May 2017. Are you getting excited about winter? Which one of these unique winter destinations would you visit first?